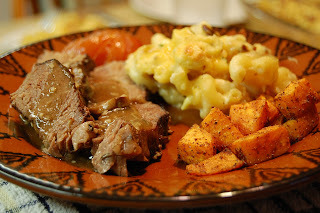 Easy to prepare and quite tasty, this recipe for Melt in Your Mouth Slow Cooker Beef will definitely be in the rotation again soon. Place meat in slow cooker (trim or remove any extra fat off the meat). Add mushrooms, garlic and tomatoes. Toss in the dried thyme. Cover and set on to LOW. Cook for at least 8 hours. Remove meat and vegetables and transfer sauce to pan. Bring sauce to a boil and reduce. Add 1 tbsp. cornstarch to 2 tbsp. Cold Water and mix in a bowl. Add mixture to sauce pan. Carve meat , drizzle with sauce.